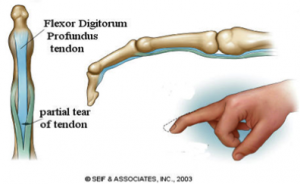 Flexor tendons are the structures that allow us to bend our fingers. The flexor muscles start at the elbow and forearm and turn into tendons just past the middle of the forearm. They then attach to the bones of the fingers. When the muscle contracts it allow the tendon to bend our fingers. Tendons can become swollen which is called a tendonitis or they can be cut or traumatically rupture from the bone. Treatment for flexor tendon tendonitis may include rest, over the counter anti-inflammatory medication, ice, activity modification, splinting, and in some cases a steroid injection may be helpful. The causes may include overuse or repetitive stress, although the condition may develop for unknown reasons. Tendons can be also be injured, for example, by a deep cut. If you severely cut yourself, the cut could also damage surrounding structures such as nerves and vessels. Many times, an injury that looks simple on the outside, like a cut, can be very complicated on the inside. A severe cut that injures the tendons will mean that you won’t be able to bend your finger. A flexor tendon that has been cut will not heal without surgery. This is an intricate surgery that should be performed by a hand surgeon. Following surgery, it will take a few weeks for your injury to heal. You will be placed in a protective splint that positions your hand and tendon appropriately during the healing process. You will not be able to actively bend your finger for a few weeks and will follow a specific protocol in order to prevent the tendon from rupturing or from developing unwanted adhesions. 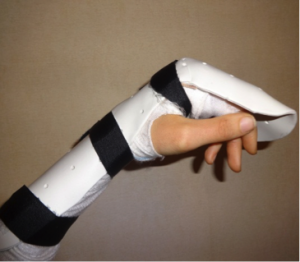 It is likely you will be referred to a hand therapist for fabrication of the post-operative splint and rehabilitation.